Are you fed up with the old and traditional houses with square windows? Move to a spaceship house! Here are a few of our favorites around the world. It was composed of fiberglass-reinforced polyester plastic. Only 50 of the 100 original Futuros are survived. The building is a one story Modernist octagon house with a 2200 square feet (200 sqm) of living square, standing on a nearly thirty feet high concrete pole. The famous Iraqi-British architect, Zaha Hadid designed the stunning 28,524 square foot (2650 sqm) mansion with a 65 ft (20 m) high tower for a Russian billionaire's girlfriend, the ex-supermodel Naomi Campbell. The famous elliptical house was one of the places where Woody Allen took a nostalgic look at the future in his 1973 movie Sleeper. The house with two bedroom and two bathrooms is upon a small volcanic cone in the desert between Las Vegas and Los Angeles, near Barstow. The conference centre and a former science museum was erected by the company Philips. Its design was based on an idea by Frits Philips, (the son of Anton Philips, the founder of the company) who just made a sketch of the Evoluon on a napkin. A BBC2 Trade Test Film about the Evoluon from 1968. The project was abandoned in 1980 due to investment losses and car accidents and it turned to one of the spookiest towns in the world. Every houses were demolished between 2008 and 2010. Began to be built in 1994 out of wood, plastic and fiberglass. 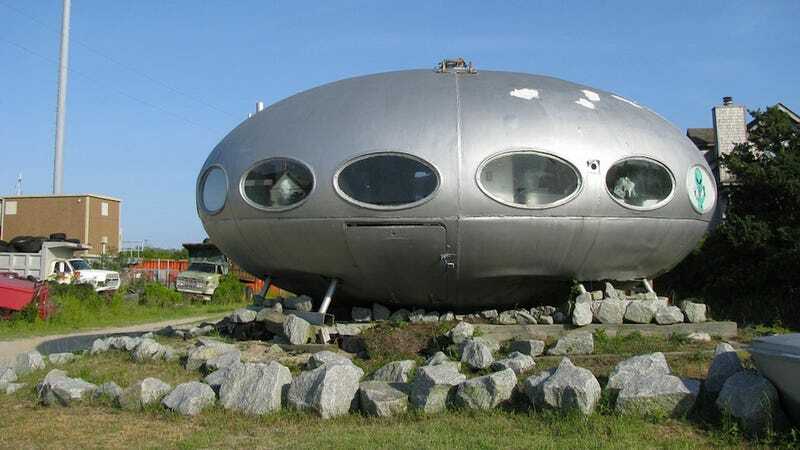 In 2003 the owner and builder, Jody Pendarvis added a smaller saucer to the top of the original 42-foot-wide one.